Delightful self-contained holiday accommodation within a very quiet and secluded position in the grounds of Kipp House, which stands in extensive garden grounds on the edge of the village of Kippford. The accommodation, which is located on the first floor with storage beneath, has been completely rebuilt, refurbished and both equipped and furnished to a very high standard. The village is situated on the Urr Estuary and is a popular sailing centre. There are two pubs serving food plus local shops and a small golf course within walking distance of the cottage. 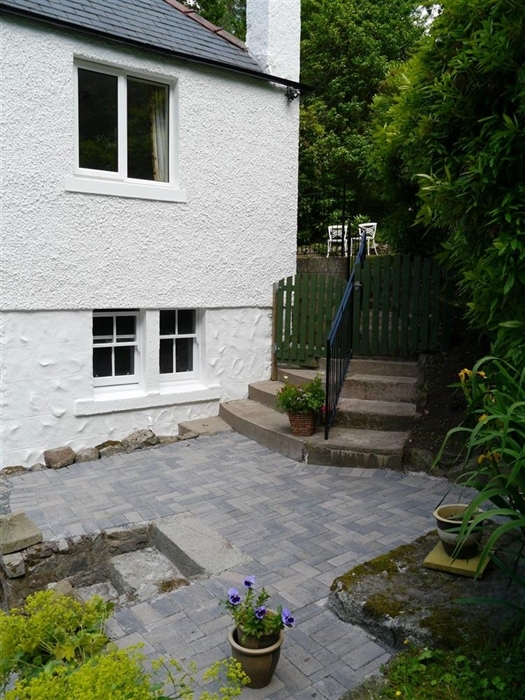 All sorts of outdoor pursuits and countryside interests are available on the doorstep and, for the serious cyclist; the trailhead for the local section of the 7Stanes Mountain Bike Network is within 5 minutes' drive of the cottage. The ground floor storage accommodation has been designed as suitable storage for bicycles and/or wet weather gear. The double glazing and full oil fired central heating make this a cosy and comfortable cottage at any time of year and is ideal for cycling couples. Accommodation for 2 on one floor: (access to the cottage from the car parking area is up a flight of concrete steps) Open plan Living room/Dining area and Kitchen with wood stove (initial supply of fuel provided) and a high quality fitted kitchen with appliances; Double bedroom; Bathroom with suite of bath, wash basin and WC with mixer tap, shower and screen. Services: Oil central heating * Initial supply of fuel provided for wood burning stove * Bed linen and towels provided * Dishwasher * Fridge (with chill compartment) * Electric oven and hob * Microwave * Colour TV with DVD player * Mobile reception variable * Small secluded garden area immediately to the rear of the cottage and patio with furniture * Secure storage for bicycles, wet weather gear etc. * Car parking for one car * Smoking not permitted * Sorry No Pets. Please note that although the cottage does not accept dogs access to the cottage is through the owners garden and you will meet their friendly dogs; the cottage garden gate and driveway gate will also need to be kept closed.